When it came out in theaters in 1971, the reviews were not so kind. However, I’m going out on a limb and disagree with the critics of the early 1970s for not seeing the ingenious and radical humor this movie offered. The film was released during the height of the anti-war and anti-establishment movement and director, Hal Ashby, was in line with the present thought of the day over 40 years ago. It may not have appeared so radical then and I suspect the film may likely appear strange by today’s standards and norms. That’s why I love this movie and have watched it more than once. In the first scene, Harold “hangs” himself on a chandelier. Mrs. Chasen walks into the room and her reaction to her dangling son is simply, "Now, Harold, I suppose you think that's funny." Harold has a fascination with funerals and attends the morbid services of people he does not know. 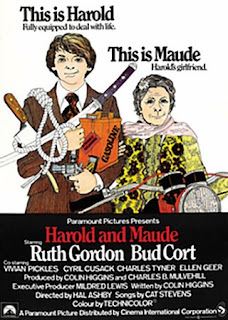 Ironically, so does Maude (played by Ruth Gordon.). Maude is 79, extremely poor but full of life. She plans to live vivaciously for the rest of her life – which she determines will be at the age of 80. Together, Harold and Maude attend funerals, picnic at demolition sites; ride fast in stolen vehicles and plant trees in the forest. They fall in love, flipping the more accepted norm of the old man and young woman romance. Maude also reminds Harold that we should not get too comfortable in life or we will get trapped and forget to live fully. “Oh, how the world dearly loves the cage,” she says. If you haven’t seen “Harold and Maude” yet and want to watch something with a quirky and creative curve that will stretch your awareness and comfort (aka cage) in life, you can easily find it on the many social media platforms. I purchased the film from YouTube for $2.99.